Geological maps are special-purpose maps made to show geological features. Rock units or geologic strata are shown by color or symbols to indicate where they are exposed at the surface. Bedding planes and structural features such as faults, folds, foliations, and lineations are shown with strike and dip or trend and plunge symbols which give these features' three-dimensional orientations. GEOLOGY is the science and study of the physical matter that constitutes the Earth. The field of geology encompasses the study of the composition, structure, properties, and history of the planet's physical material, and the processes by which it is formed, moved, and changed. Colours of rocks - Although there is a data standard for rock and strata based on type of rock and geological age of the rock, due to the complexity of mapping needs it is essential you refer to each Map Key or Legend to understand the type of rock and its geological age in the area you want to prospect. Download the Standard Mapping Colours from this site if you are interested in them. "In the 1980s, Geoscience Australia's predecessor, the Bureau of Mineral Resources (BMR), published an Australian standard colour scheme for geological maps. However, the increasing complexity of geological maps published in recent years has meant that maintaining a single colour scheme for all geological maps is no longer practical. The BMR colour scheme may, however, be applied to some geological maps as a rough guide." 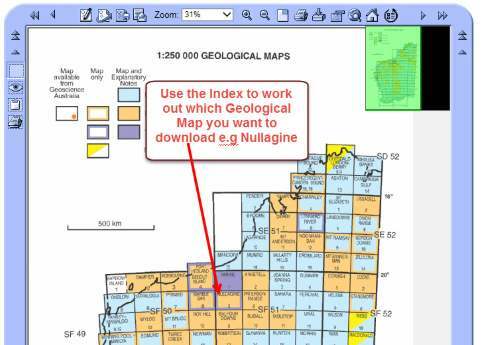 However, on the same page you can download a free electronic publication Symbols Used on Geological Maps which is the standard symbols that are used and a valuable reference for your own use in understanding geological maps. Link to the DMP Geoscience publications Free Online Geological Maps from DMP Online e-Bookshop. Here is how you can use the Geoscience Publications Page to to access the Free 1:100000, 1:250000 Maps or any other digital information you need for your analysis of good Gold Prospecting Locations. The first step is to get to the Department of Mines Online Systems page and in the first step we have shown you how to do that if you ever lose the direct links which is in the next paragraph. 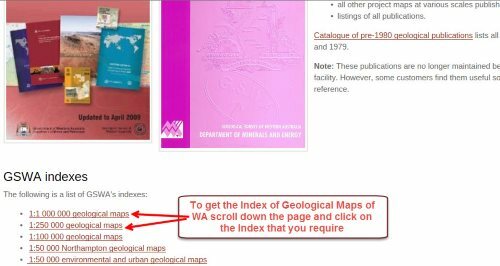 This is the page to get the 1:100000 and 1:250000 Index maps for WA Index of Geological Maps of WA. Click On the index you would like and download the page. If you would like a more in depth free booklet on understanding Geology and Maps then you can use this link to download a free digital copy of the booklet An Introduction to Geological Maps by G B Lewis. Just scroll down the page to see the free download link. Dont worry about the price on that page, that is for a hard copy of the book.